You Save: $3.20 (20%) Ships in 1 day. Soft Cover, 370 pages, 6 x 9. Indispensable, essential, and valuable reading for the cerevisaphile (sei-rei-vee'-see-uh-fiyl)! 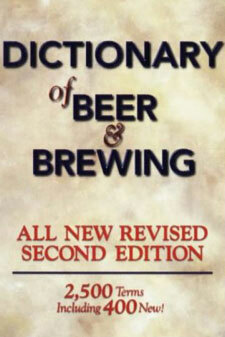 This completely revised and expanded edition of Brewers Publications' best-selling The Dictionary of Beer and Brewing presents 2,500 technical, historical, and cultural beer-related terms and definitions gathered from around the world. Each term and definition is concise, clear, up to date, and accompanied by pronunciation guides. They have all been checked for technical accuracy by historians and professionals in the brewing industry. Handy conversion tables are an added bonus. lagering. (la'-ge-ring) Storing bottom-fermented beer in cold cellars at near-freezing temperatures for periods of time ranging from a few weeks to several months and occasionally up to a year, during which time the yeast cells and proteins settle out and the beer improves in taste. This technique originated in the Bavarian Alps in the fifteenth century and was later practiced on a larger scale in Munich, Vienna, and Plzen. Syn: cold lagering. Dan Rabin is a freelance writer and award-winning homebrewer based in Boulder, Colorado. He revised the original dictionary, compiled by Carl Forget of Hull, Quebec.